Millions of Iranian and Kurdish Sufis, in Iran and Iraq as well as in the Iranian and Kurdish communities abroad, will have observed the 10th anniversary, on Nov. 18, 2011, of the death of one of the greatest spiritual musicians known to them in modern times. His name was Seyed Khalil Alinejad and he was killed in Sweden at the age of 44. Although he is unknown to the wider world, he was an unparalleled adept of the tanbur, a long-necked lute. He was the son of a distinguished tanbur player and was encouraged to study music by his mother. Seyed Khalil completed the lengthy apprenticeship required of musicians in the Eastern tradition, and mastered all the important instruments in Persian and Kurdish music, as well as singing and composition. His most important teacher was a Sufi guide and musical virtuoso, Abedin Khademi. But the disciple became the initiator of a system of notated transcription of tanbur music, which had previously been taught and transmitted exclusively in oral form. Seyed Khalil created a musical group that still exists, the Baba Taher Ensemble, named for a classic Persian mystical poet whose verses have left a deep influence on the development of Iranian music. In the 1980s, Seyed Khalil produced albums of his songs as well as a book on the tanbur. His admirers have honored him by reissuing collections of music by the Baba Taher Ensemble and new editions of his writings. 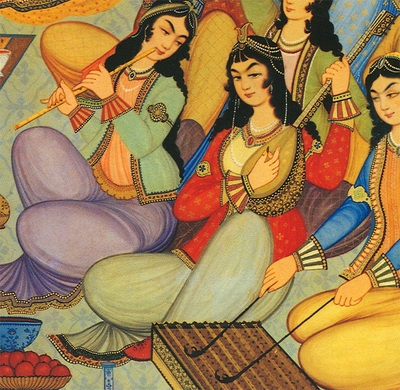 Iranian women playing the tanbur, painting from Hasht-Behesht palace, Isfahan, Iran, 1669 – Photograph Via Wikimedia Commons. He was an extraordinary performer, with a face that, while youthful and guileless, seemed filled with permanent awe at the spiritual realities of which he knew: he power of God, the eloquence of his Sufi peers, and the drama of spiritual struggle seen in the lives of Imam Ali, progenitor of Shiite Islam, and other forebears. His performances included works he wrote to accompany the poetry of the great Sufi, Jalaladin Rumi. Seyed Khalil was an adherent of a Sufi movement with many members, but about which little is publically known -- the Ahl-e Haqq or People of Truth, who claim millions of "hidden" acolytes in Iran and Iraq, especially among Kurds. For the Ahl-e Haqq, music transcends formal prayer as a means of sacred devotion. For other followers of esoteric Islam, music is an accessory to religious expression. But their dedication to music has given the Ahl-e Haqq considerable influence in Iranian culture, notwithstanding their reticence in revealing their Sufi identity and beliefs. The Ahl-e Haqq belong to a spectrum of Sufis from the Balkans to Central Asia that have included hymns and the use of stringed instruments as essential observances of their faith. In the Albanian lands, this attitude is represented by the Bektashi Sufis, who sing and recite poetry as praise and expression of unity with God and creation. In Turkey, the vigorous "movement" of Alevi Muslims has made the melodies of the saz, an instrument closely related to the tanbur, the basis of their collective ritual, or cem, which is mainly composed of dancing or semah, led by women. Albanian Bektashis, Turkish and Kurdish Alevis, and many of the Iranian and Kurdish Ahl-e Haqq affirm their belief in the equality of men and women. It is said of the Alevis and the saz, and of the Ahl-e Haqq and the tanbur, that in the home of each member a musical instrument may be found. The Ahl-e Haqq also perform on the daf, a flat, circular drum, and the tar, a Persian lute. A large group among the Turkish and Kurdish Alevis join the Albanian Bektashis in celebrating the Turkish mystic Haji Bektash Veli (1209-71 C.E. ), who was almost an exact contemporary, and a friend, of Rumi (1207-73), but has yet to be introduced to a mass audience in the West. Seyed Khalil Alinejad was and remains beloved by Iranians, but went to live in Goteborg, Sweden, where he resided in a hostel for asylum seekers and other immigrants. 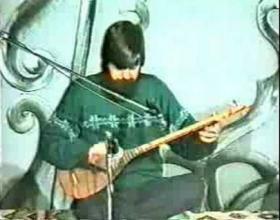 He adopted a humble life-style, teaching classical Iranian and Kurdish instruments and song to adults and children. Those who knew Seyed Khalil say that as a Sufi he was pleased to serve and thought nothing of the rewards of the ordinary world. He often donated instruments to students and spent many hours with the youngest among them. He was stabbed to death one morning, in the building where he came to teach his classes, before a fire in the lower floors of the structure. The cause and perpetrators of his death have never been identified. It remains a "cold case" in Goteborg police files, a legal mystery appearing tragically among the spiritual mysteries of Sufism. But his Sufi passion and his music remain alive among the initiated. Soon, perhaps, Seyed Khalil Alinejad will become known throughout the world, as he and his legacy deserve.